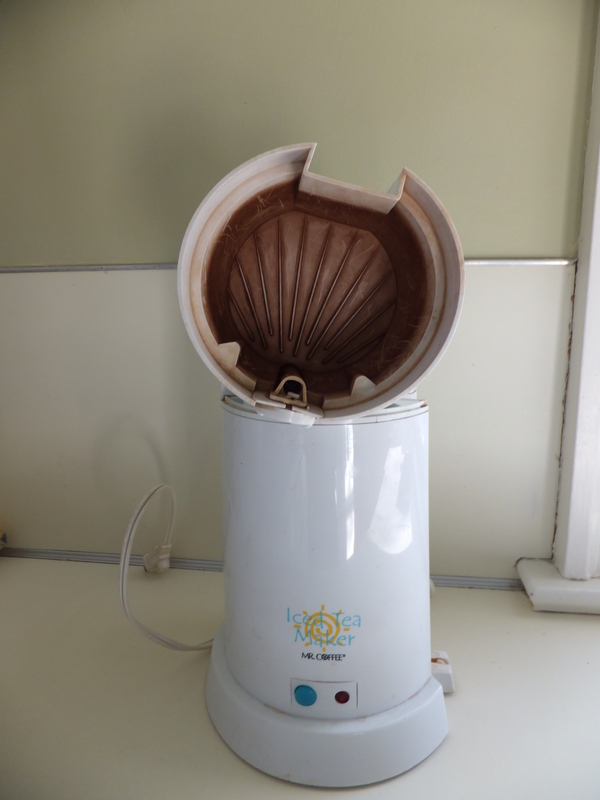 This is a simple and quick tip on how to clean your old ice tea maker. 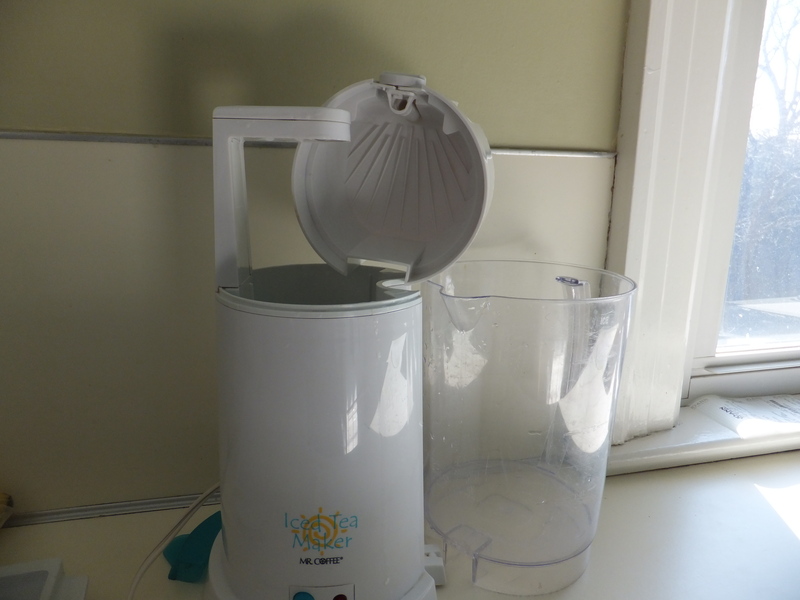 If you are like me, your ice tea maker looks something like this! 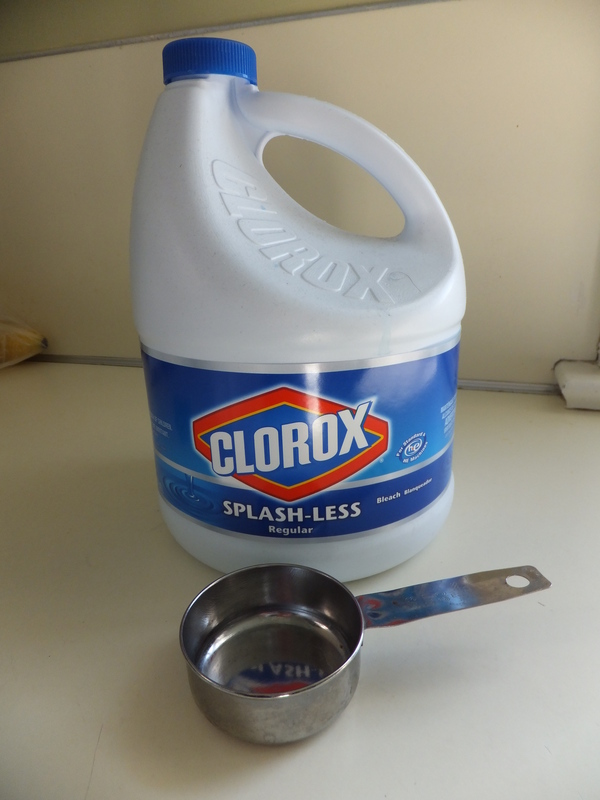 Just put about one half cup of Clorox into the tea maker and fill the rest with water. Close the tea maker release, just like if you were making tea. This will allow the Clorox to sit in the top and take off that nasty staining. Put the pitcher in place and push the on button.
. Once the tea maker has turned off you may now let the Clorox water sit in the pitcher. This will clean any stains in the pitcher. 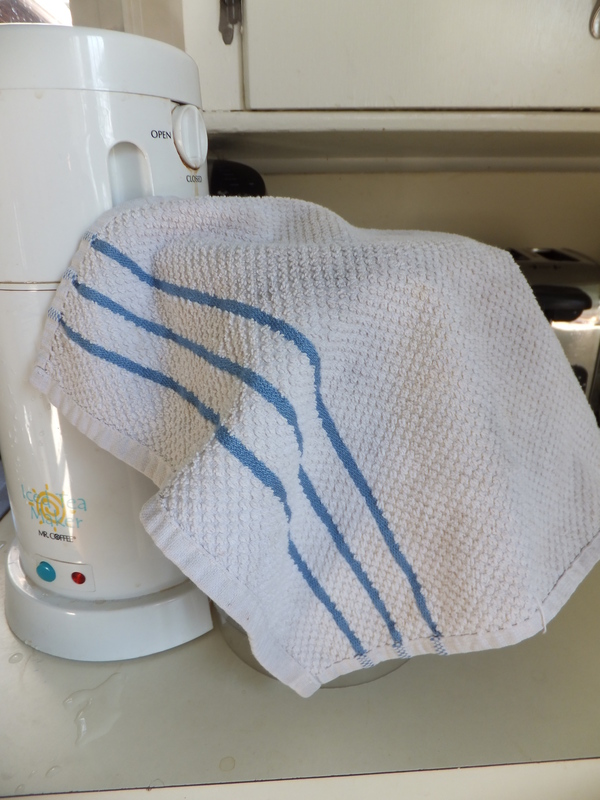 Use a dish rag to wipe the remaining stains from the inside of the tea maker. This is a good time to wipe down the outside of the tea maker. The dish rag will have enough Clorox on it to clean the lighter stains on the outside of the tea maker. The bonus is that your dish rag will also be a lot cleaner from the Clorox. Now rinse the top of the tea maker and the pitcher and then run several cycles of clean water through the tea maker to get out any of the Clorox that may remain. I have purchased a new Cricut Explore and I love it. My favorite thing about the Cricut Explore is that when you pick your design, Cricut Design Space puts all the “parts” on the screen for you. This makes cutting out your design so easy! 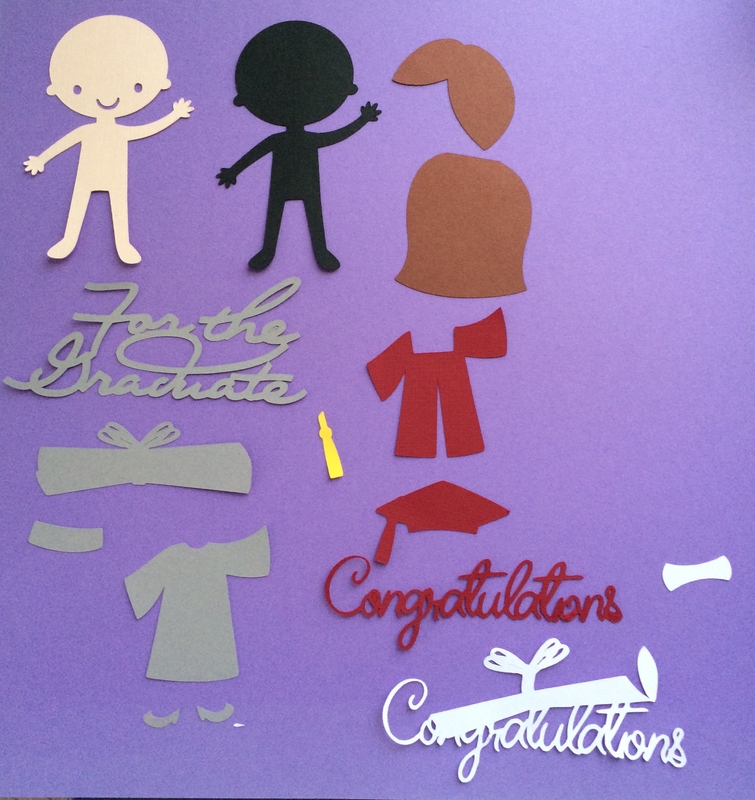 This is a graduation card that I made for a friend’s daughter. 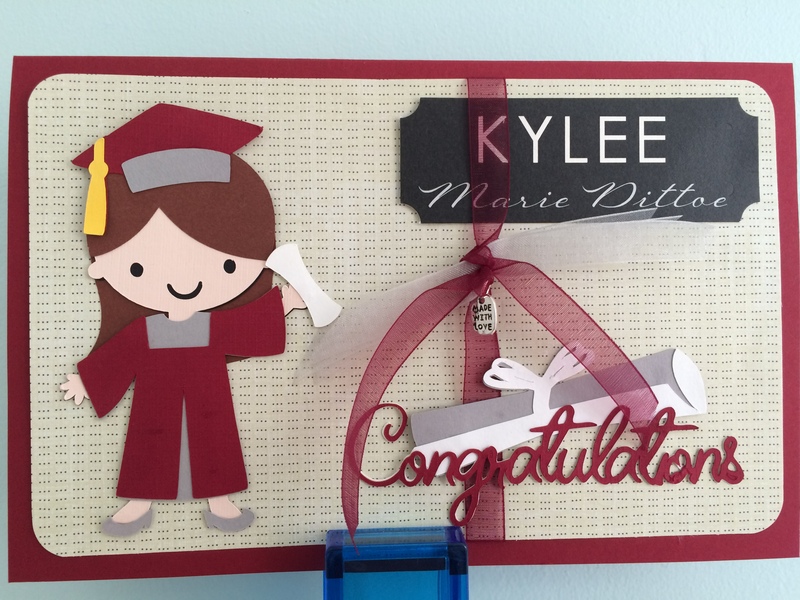 The graduation girl came from “Create a Friend”, but one of the drawbacks of the Cricut Design Space it that when you choose your designs, it doesn’t tell you what cartridge they are from…Boo…Hiss! I am not completely sure, but I think the words are from “Wild Card”. 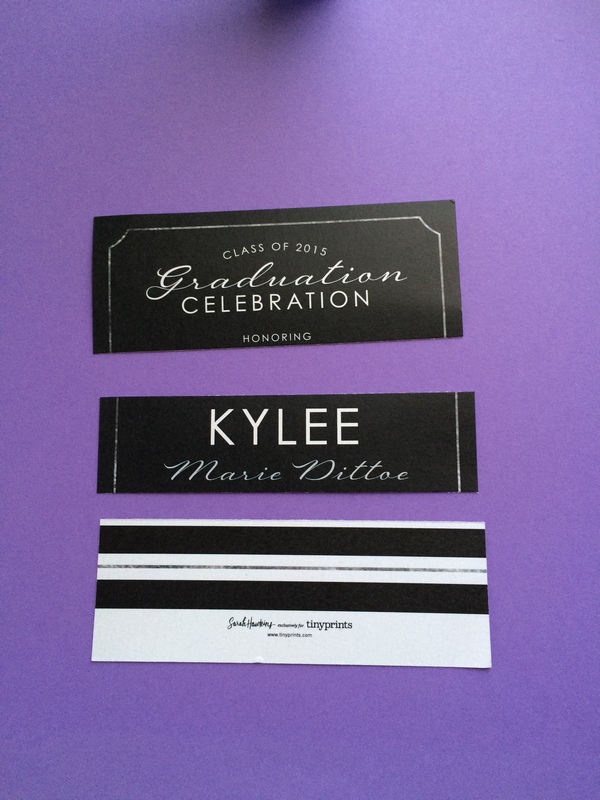 These are the layers that are included in the card. The Cricut Design Space and Cricut Explore will put these on the screen for you, but just in case you haven’t updated to the new machine, I have included a picture. This may also help you when you are choosing the colors for your cuts. 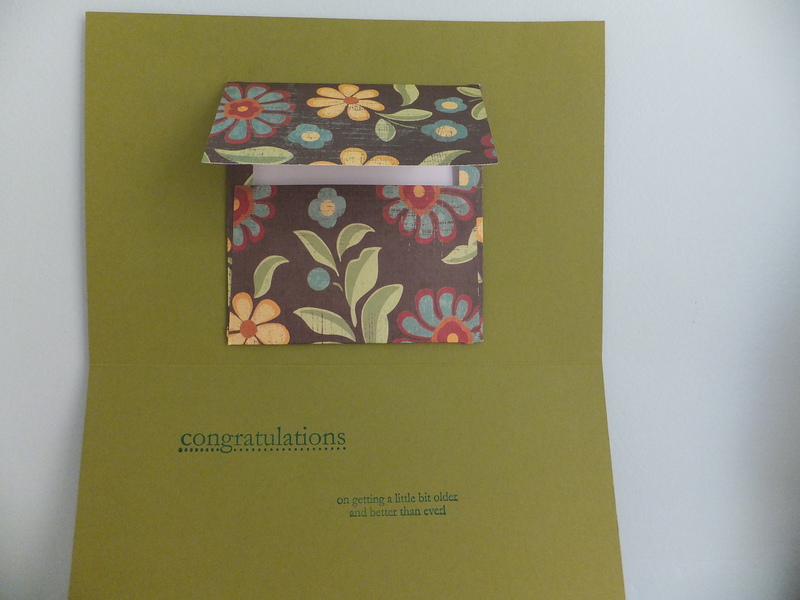 I used the invitation I received for the front of the card and the inside. 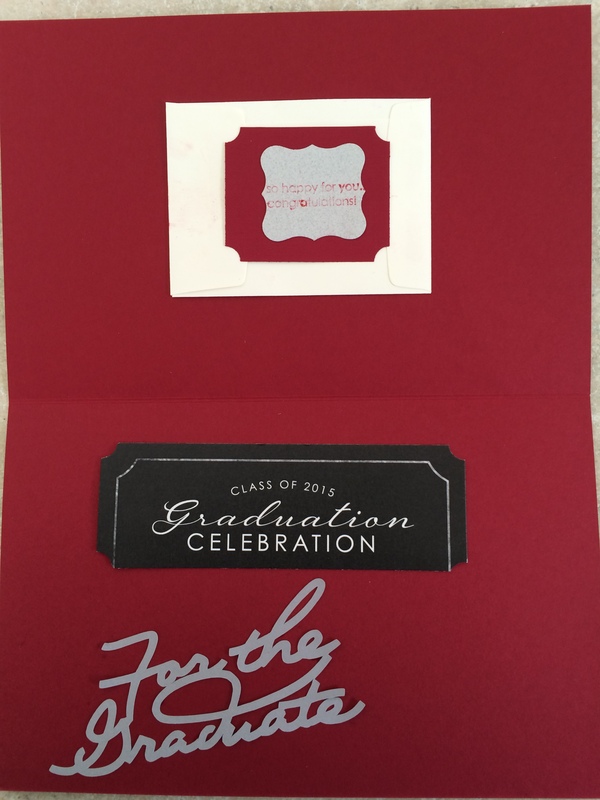 On the left is the inside of the card and on the right is the “cut up” invitation. The fabric in the block was not really my first choice. I went on a weekend get-away with several of my quilting friends and purchased two new fabrics for my Farmer’s Wife Quilt. I picked up another color way of my bucket list fabric and this light blue. When I got home, I just had to make a block with some of the new fabric. 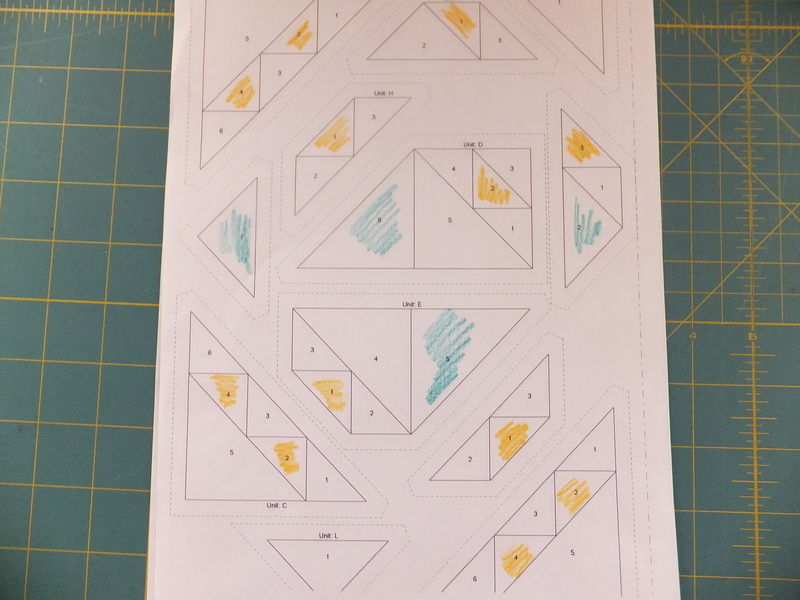 I soon realized that I had skipped block # 22, so late at night I choose the fabric for the Corn and Beans block and went with the traditional dark green and yellow. I made one sections of the block and then retired for the night. The “Quilties” were arriving at 9 the next morning and I was up early cleaning and preparing lunch. 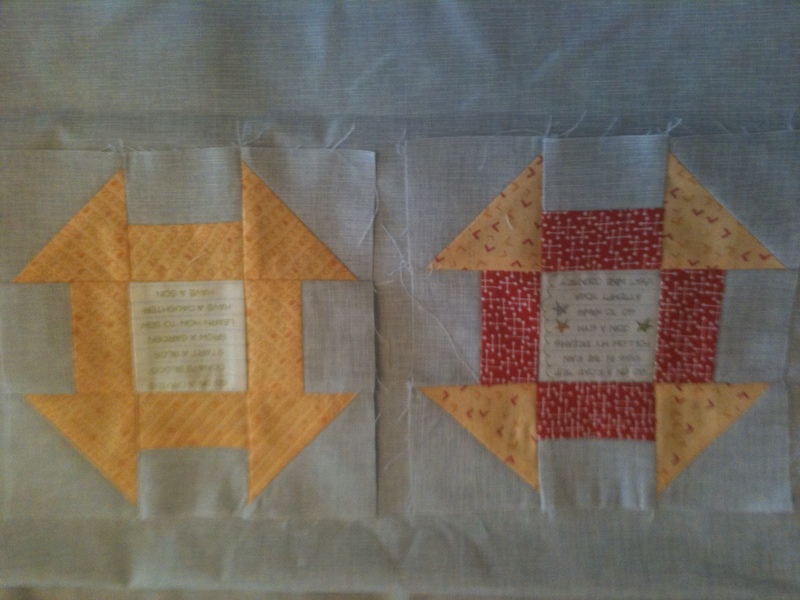 As we sat down to sew, I started in on the Corn & Beans block. I finished several more sections before I turned it over and realized that I had picked up the light blue instead of the dark green, so that is how my Beans became light blue. I still like the block, but it does not look like corn and beans. I first used colored pencils to mark my placing of the colors for this block. This block was kind of tricky. 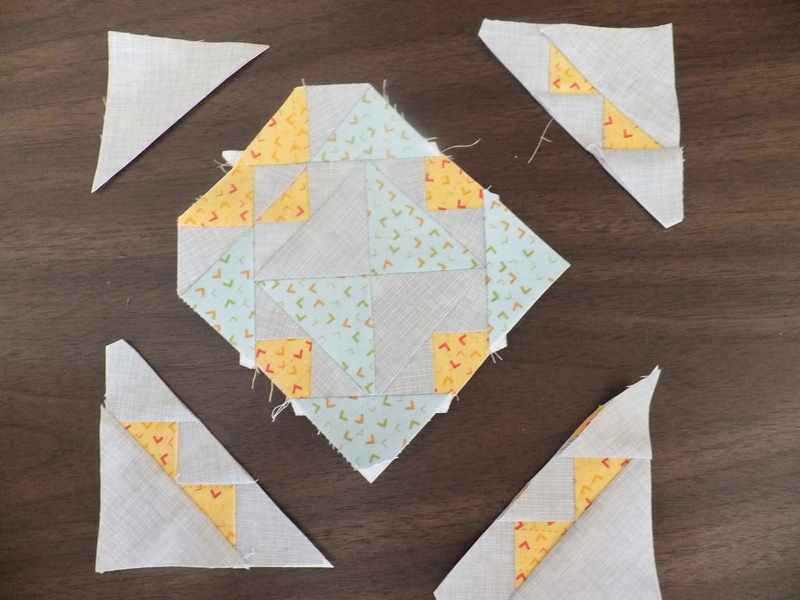 Remember if you use the paper piecing that the block is reversed from the picture in the book. 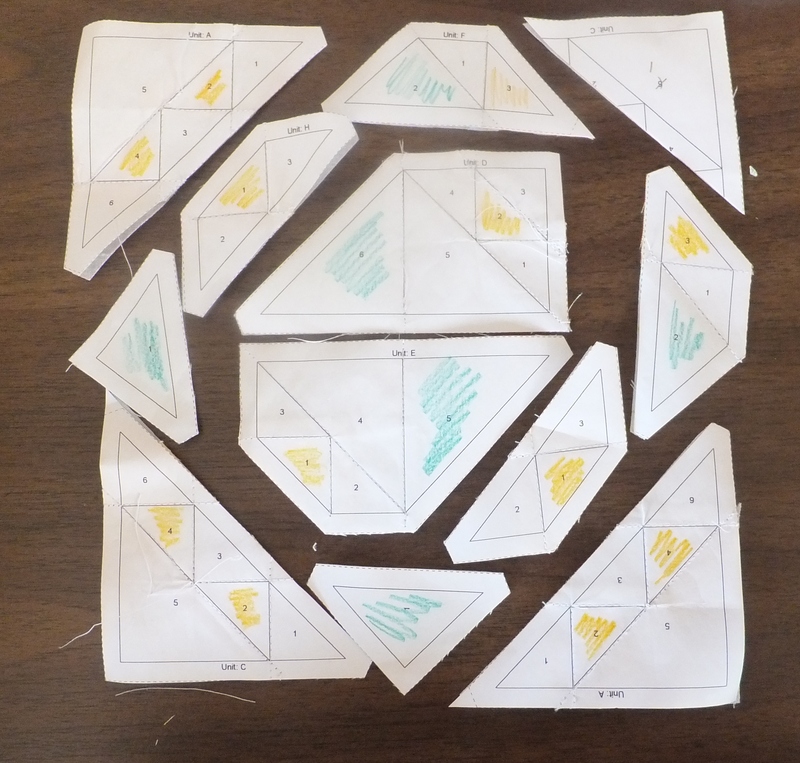 If you get stuck, just turn over the pieces and lay them out to match the image in the book. This is the first step in the block construction. Next sew the center two sections together. The next three steps added the bottom left section, the top right section and the left section in that order. The fourth step was to attach the top section. Now add the two small triangles. 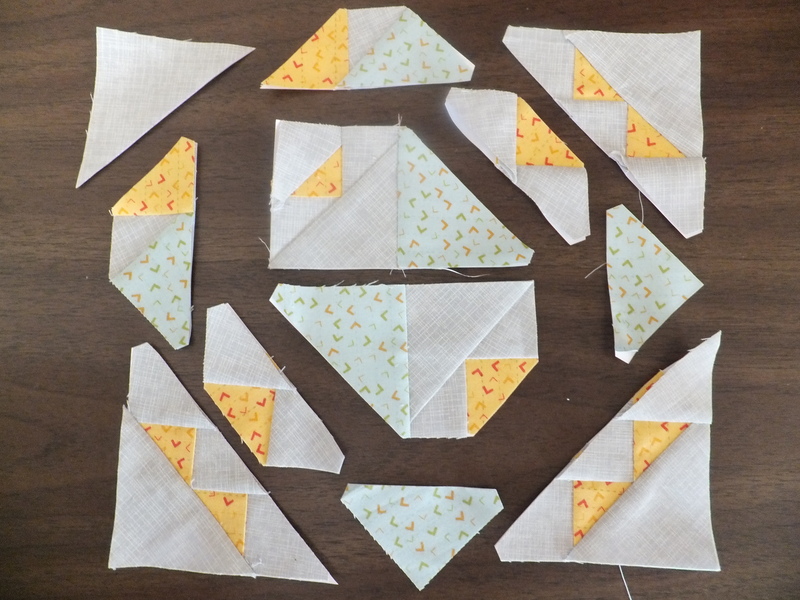 The last step it to add your 4 triangle sections and your block is now complete. I think the block is a little light. I am going to float my block in the gray fabric, so I hope that it does not get lost in the setting. I am sorry to say that when I complete this block, I did not take any pictures of the process. 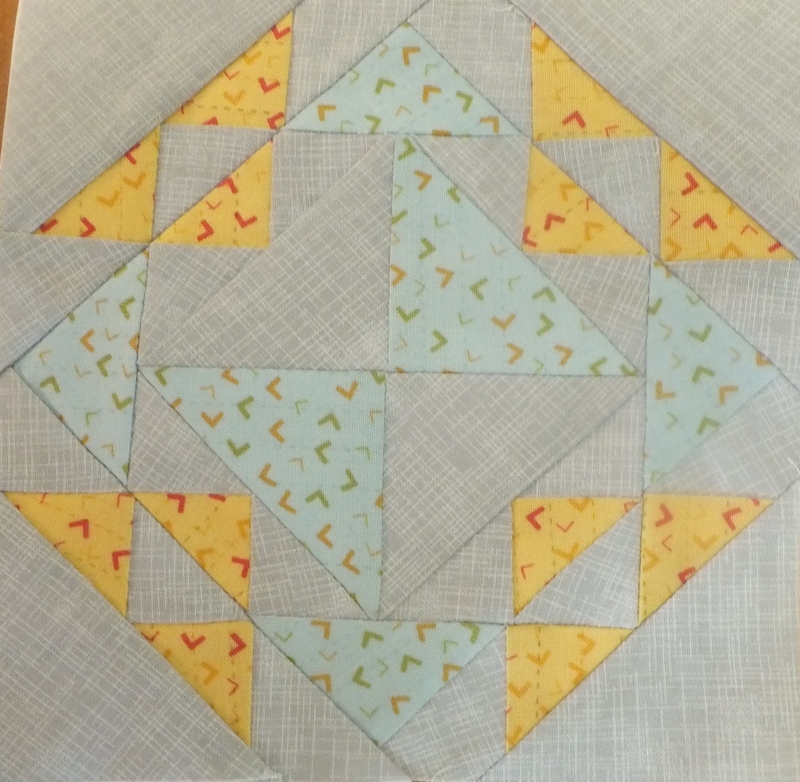 I paper pieced this block. With 23 blocks completed you now have 88 to go….good luck! 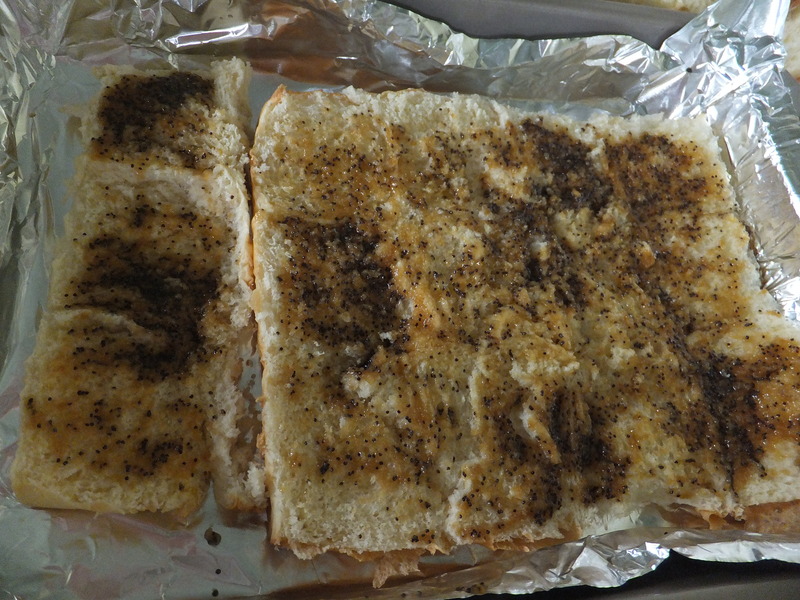 I just made these Sammies for my quilting friends, but the recipe was given to me from my niece’s sister. She served them at Jenna’s wedding shower a couple of years ago. I have made them several times and everyone loves them! 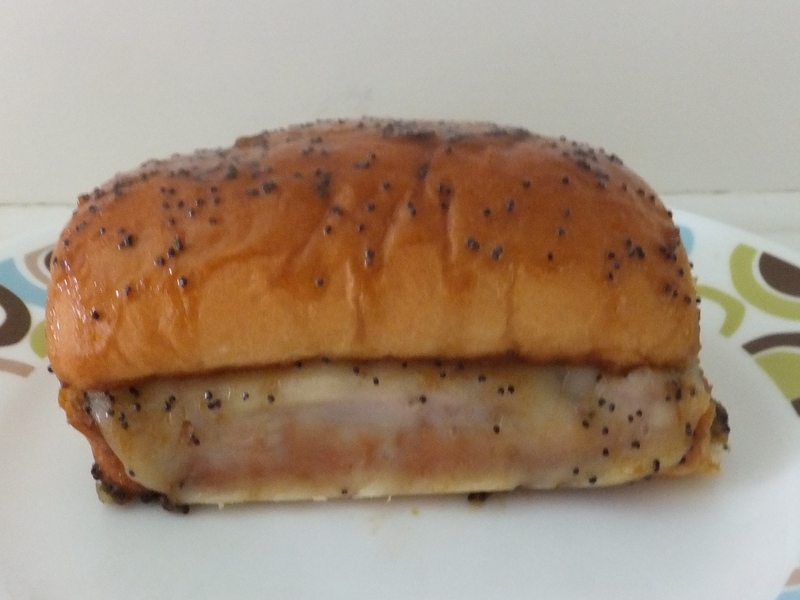 In the picture above, I used the Hawaiian Sub rolls. Melt butter, then mix all of the remaining dressing ingredients together over medium heat until well mixed. 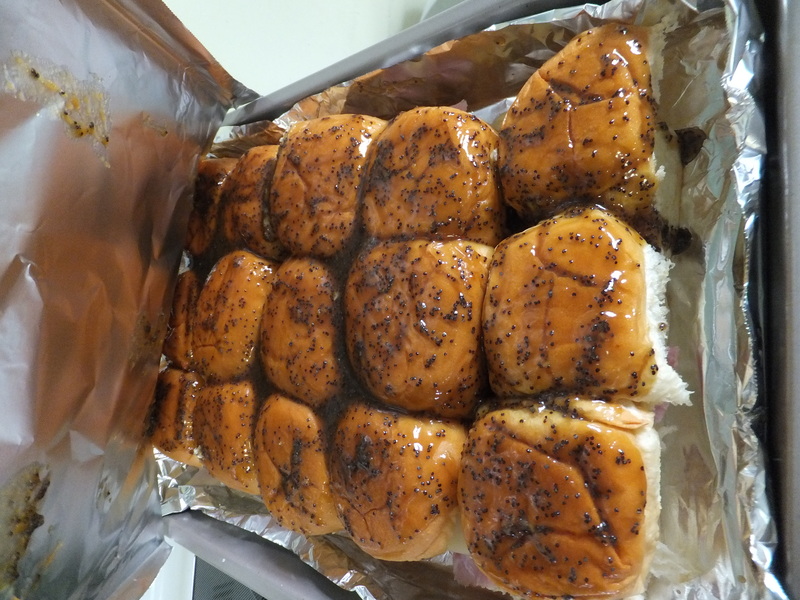 Slice all of the bun in half (like a sandwich) and spoon some of the sauce on the bottom halves. 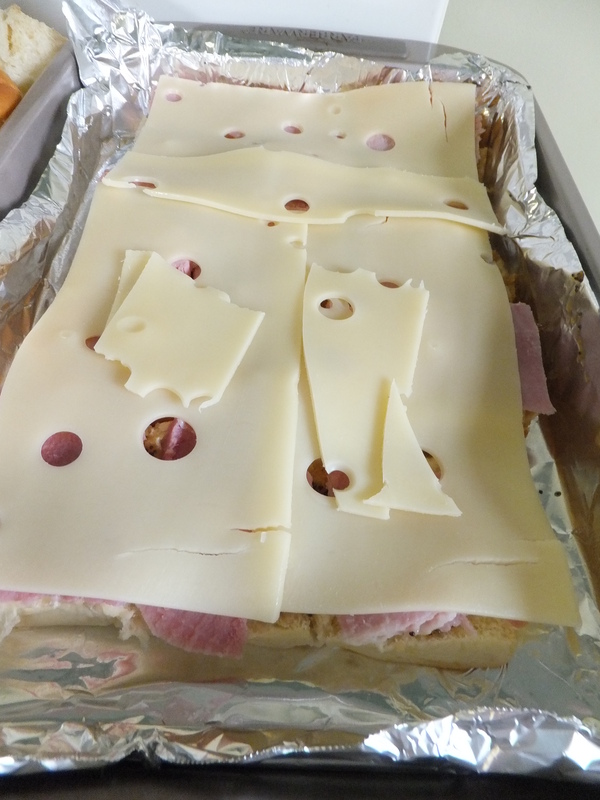 Lay meat and cheese on the bottom half of the buns, then top with the top part of the bun. Pour the remaining dressing over the top of all the buns and bake at 350 degrees for 15-20 minutes (or until the cheese melts) I used one 9×12 inch pan and on 8×8 inch pan. I lined the pan with foil to help with clean up. 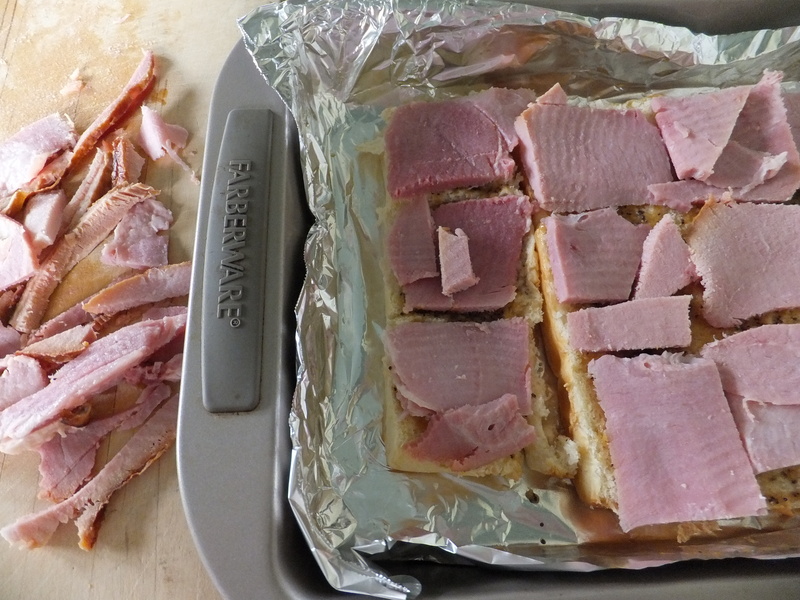 You may need to tent with foil to prevent the tops from scorching if you need to keep the sandwiches for longer than 15 minutes. 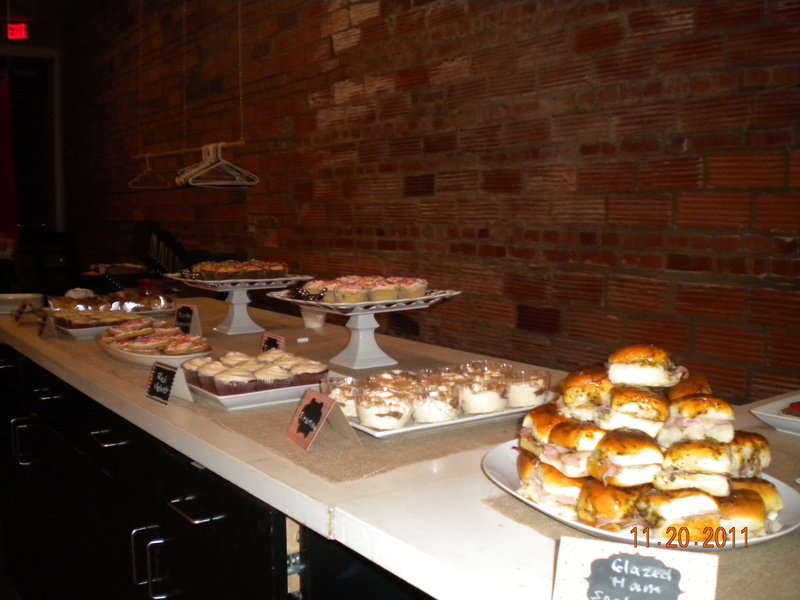 This is a picture of the food table at the Wedding Shower and the new Mr. and Mrs. Settles! 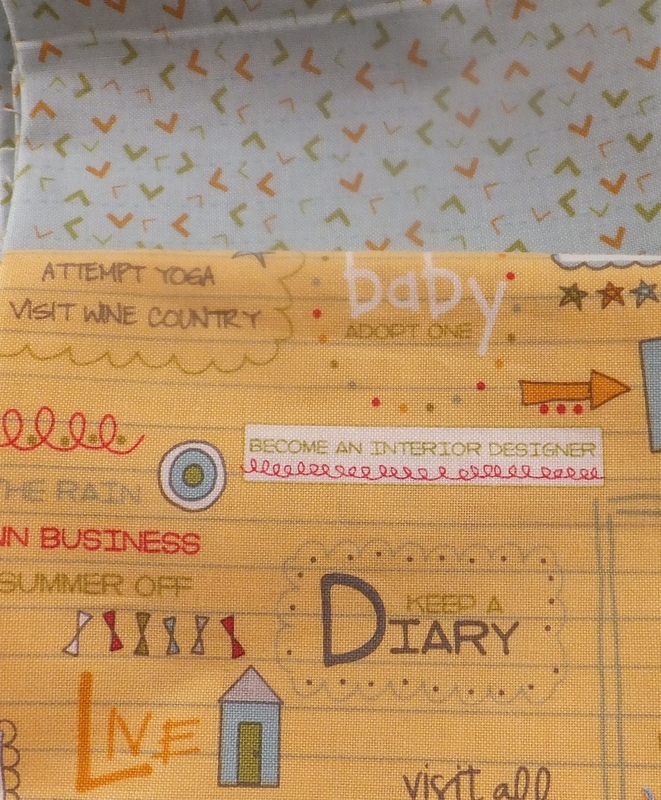 I just purchased the “Nifty Fifties” Cricut cartridge and I love, love, love it! 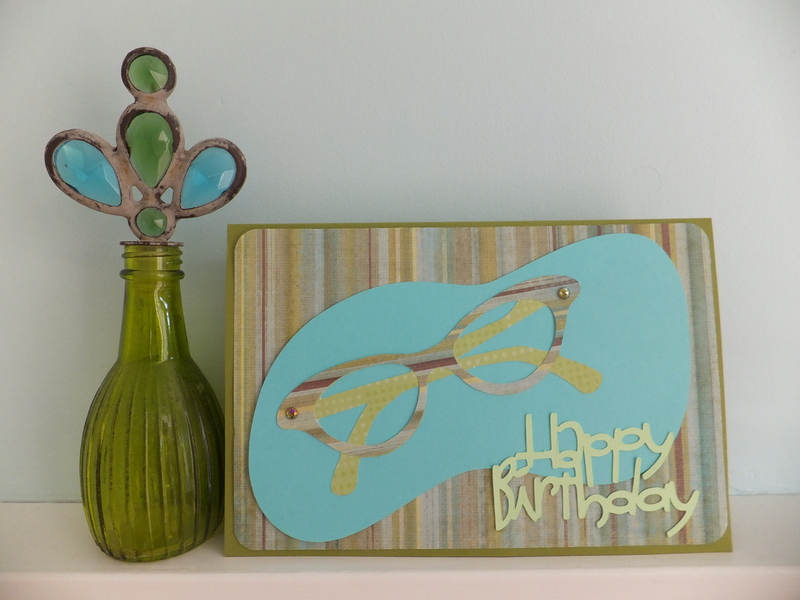 The moment I saw this pair of glasses, I knew I must make a card for my younger sister, Terri. Terri always loves to make a statement with her glasses and is always searching the internet for unique frames. This is one of the easiest cuts I have done with the Cricut. There were only three cuts. 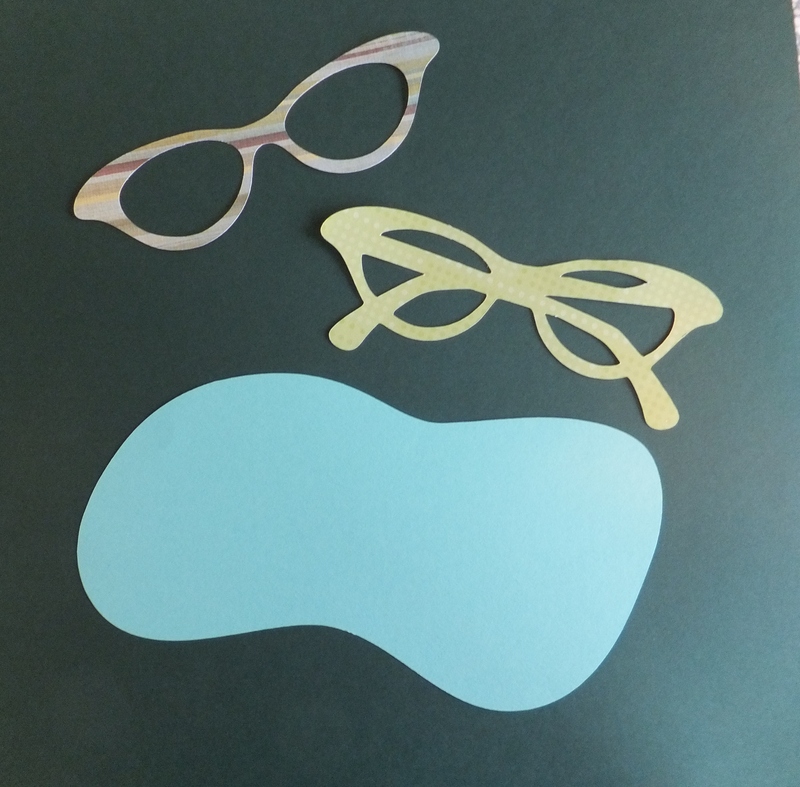 I cut the glasses out at 5″. I used a full sheet of 8 1/2 x 11 paper for the card and folded it in half. The background stripe was cut at 5 1/4 x 8 1/2 and I then rounded the corners of the paper. “Happy Birthday” was cut at 2″ using the “Wild Card” cartridge. I added rhinestone to the corners of the glasses for a little bling. I purchased a gift card, so I made a little envelope on the inside of the card. This was found on page 81 of the “Wild Card” cartridge! 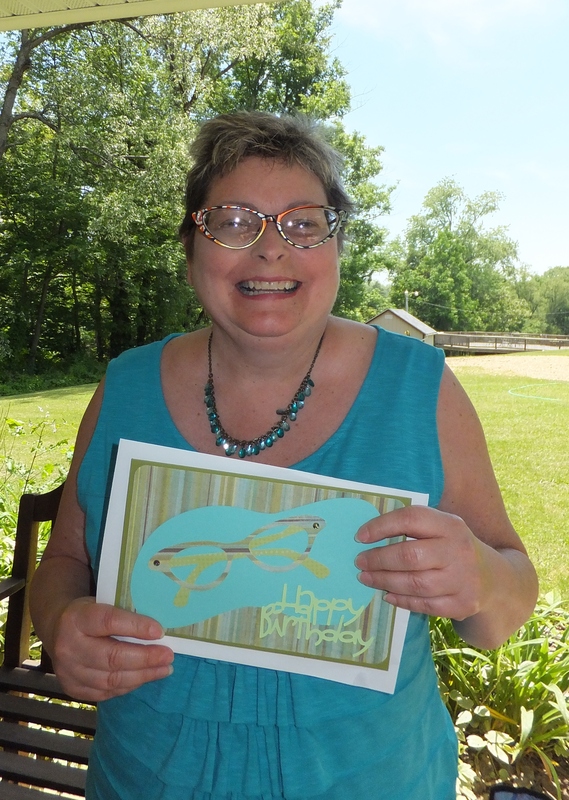 As you can see from her photo, the card matched her glasses. 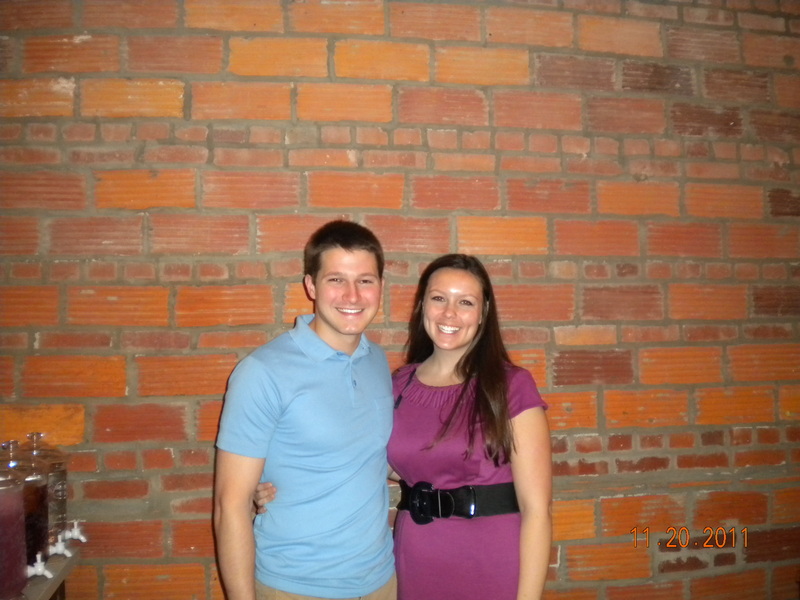 Happy Birthday Sis! Isn’t there a saying, “…the best laid plans of mice and men…often go astray”. Well I can certainly tell you that is a true statement. 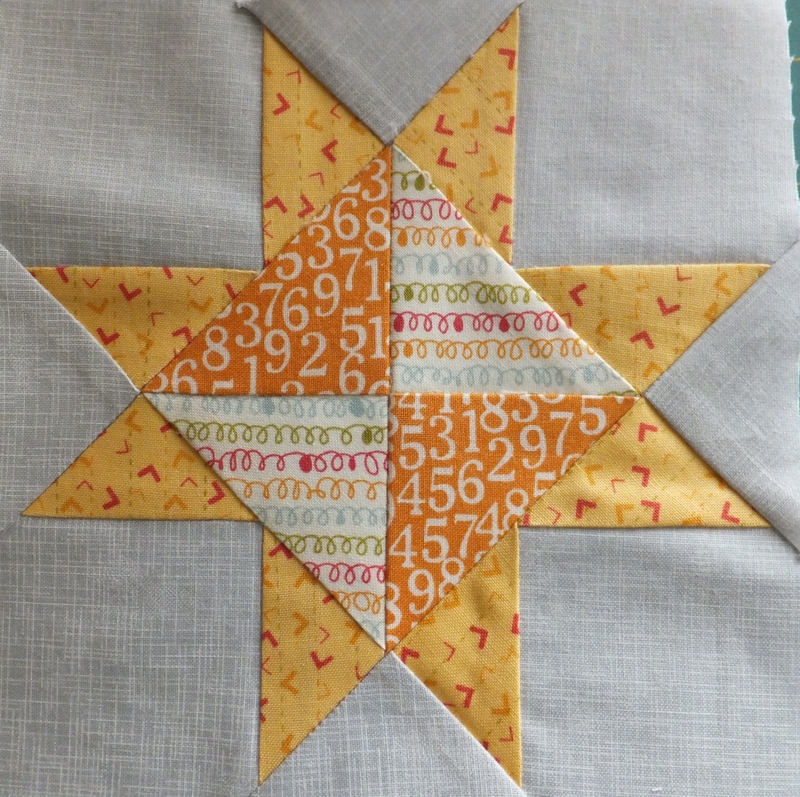 In the Spring of 2013, I made great plans to have this quilt completed in a year. It is now almost the Summer of 2014 and I am only a little over a third of the way finished. The worst part about this is that I have only posted 19 of my finished blocks. So this time there will be no grand statements for when the blocks will be completed! I will TRY to post two per week. This was one of the first blocks that I completed. 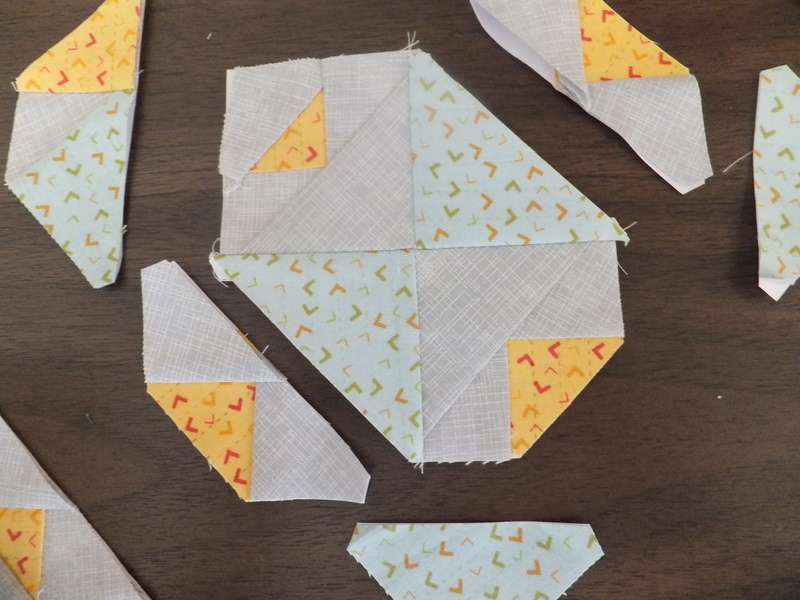 I did not use the paper piecing for this block and I also did not take any pictures of the sewing process. 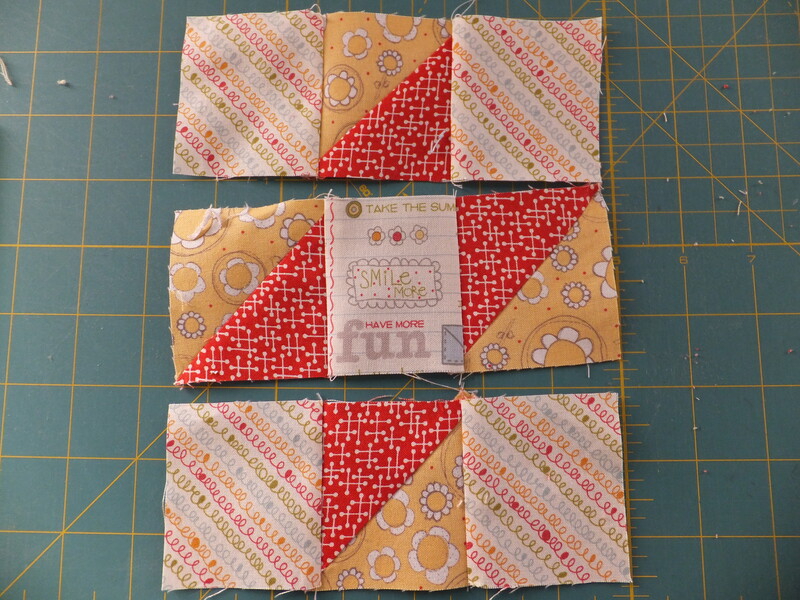 This is a fairly simple block to complete. While you are making this block, you may also want to jump ahead and complete #111 Wrench. These blocks are constructed the same, it is only the color placement that changes the look of the blocks. This is an up close picture of the center of my Churn Dash block. 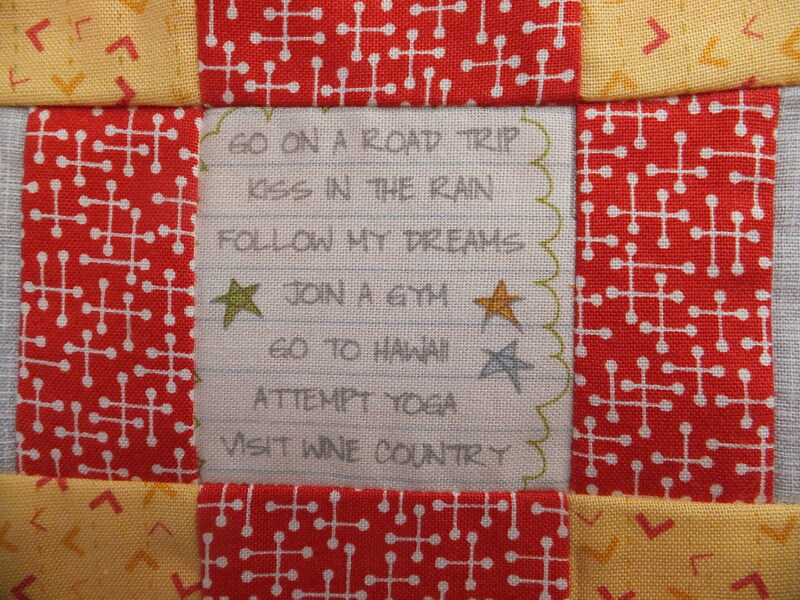 I still love the “Bucket List” fabric that I am using in this quilt. Well, I guess I can mark off number 4 on this list since is just says “join a gym” and nothing about “going to the gym”. I’m not really sure I like the name of this block, but I do like the way it turned out. 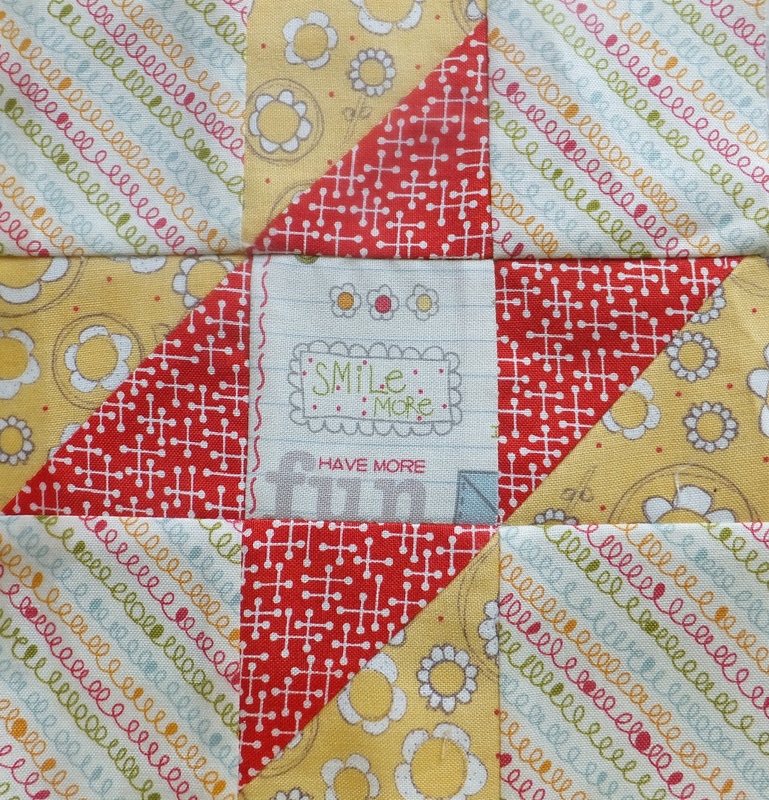 The “smile more” and “have more fun” in the center block were my inspiration today. I had many things to do around the house,(one being…writing this blog) when my friend invited me to have a relaxing day at her pool. I then took one look at this block and headed out the door with my bathing suit in hand. 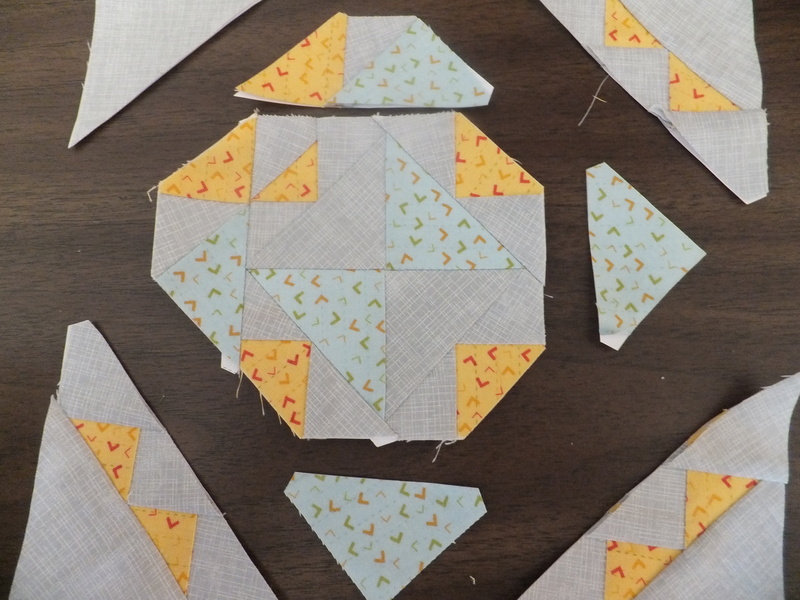 I did not use paper piecing for this block. 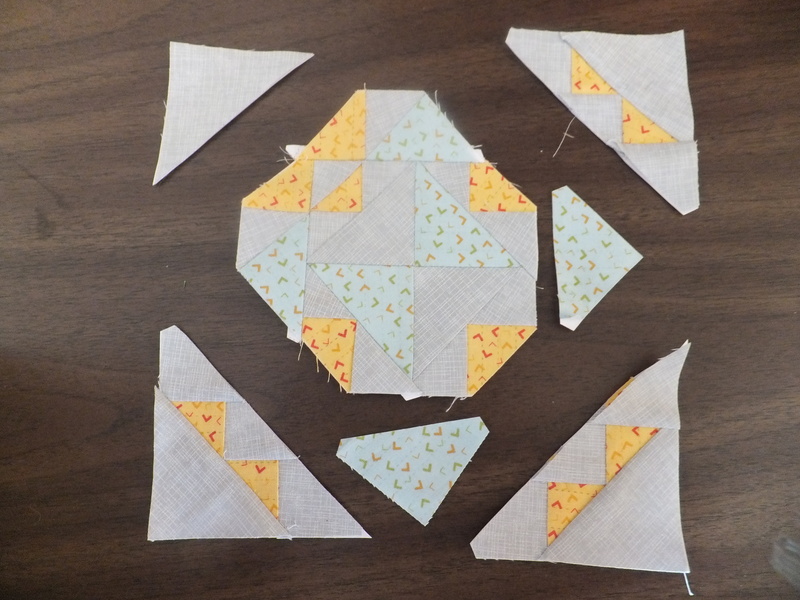 The center and corner pieces are 2 1/2 ” squares and the other four pieces are half-squared triangles cut to 2 1/2″. 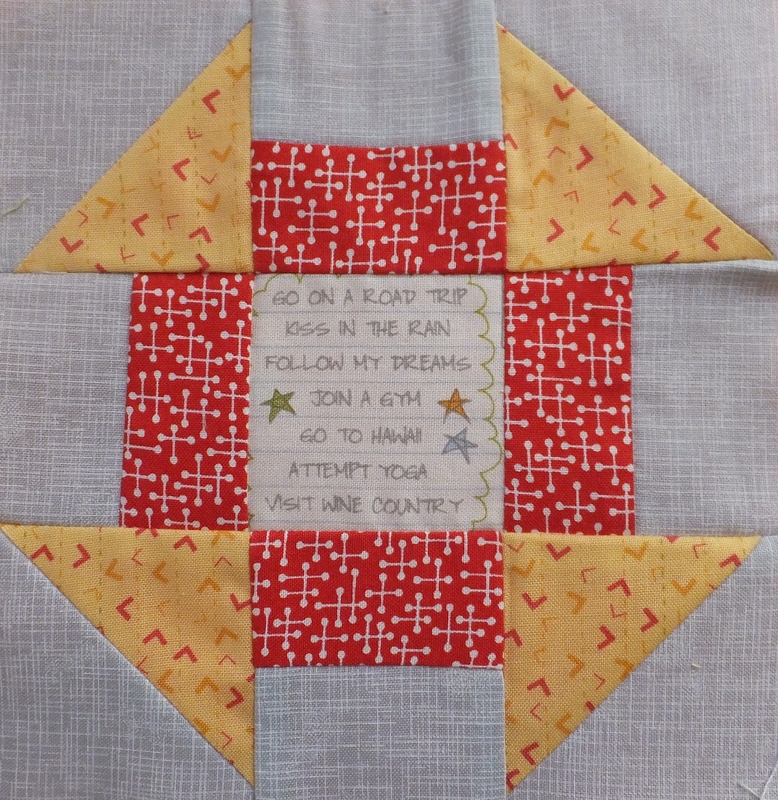 I hope you enjoy these blocks and follow me on my new journey to complete this quilt. Happy sewing!